It’s been a little while since I last posted any pictures by the Oh Waily kids, and now I’m about to deluge you with them. Well, it’s only Miss Oh Waily’s art this time as she had a very productive hour of art a few days ago. I bought some oil pastels a few months back for them to use instead of crayons. The colours are so much brighter, and the only hiccups we’ve had with using them is Miss Oh’s desire to remove the paper that they are wrapped in and Master Oh’s desire to press so hard with them that they snap. So here is Miss Oh’s latest artistic endeavours. 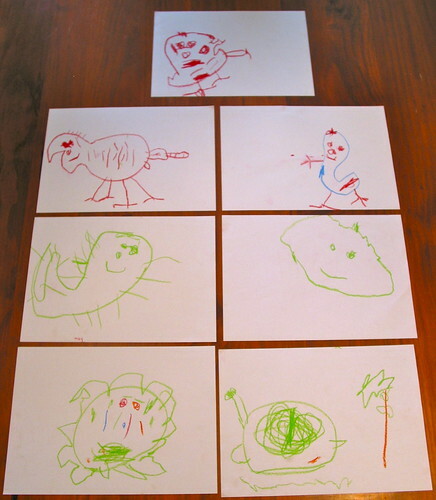 From the top: a kangaroo, a zebra, a chicken, an octopus, a raincloud, an alien, a snail with a pine cone tree. And here is the flip side of the images. I usually name and date the art that I plan to keep, so when I was doing this, Miss Oh decided that she wanted to write her own name too. 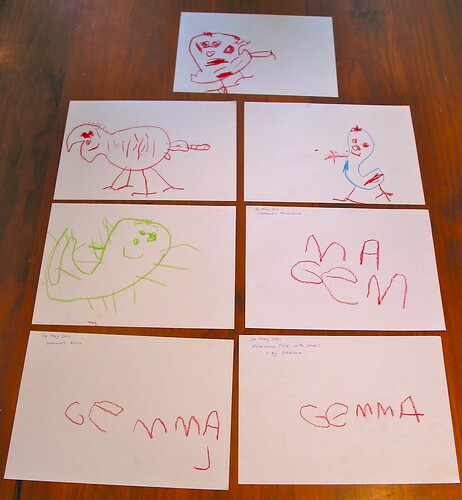 So, here are the first pieces of Miss Oh Waily’s signed art. Writing her name is a recent development and she has perfected it, mostly, within the last week. As you can see, when you run out of space you simply put the extra letters above. Shortly after doing this Miss Oh asked me to spell her brother’s name, so I imagine we will see his name appearing on the back of his art shortly. Forgers beware. Thanks. She’s coming on in leaps and bounds. Kids just seem to like to do their own thing and in their own time, no matter what opportunities they’re given. Interest in writing is pretty new here, but according to what I’ve read in the Montessori books, Miss OWW is just coming into that age bracket where it all starts. And as it says, reading & writing in tandem, but with writing edging to the front. im glad im not the only one that uses oil pastals and not crayons lol and yup Dakota takes the paper off them too. Yes, the oil pastels are a good alternative to crayons. Much brighter colours and a nicer texture too. Taking photos is a great idea. I do that for the whiteboard pictures they do. I may eventually get to doing that for some of the physical ones too, but I haven’t filled up their A3 folios yet. Maybe once it gets to the ridiculous stage I’ll cull & photograph.